These images depict “Native American” items for sale on amazon.com, but there’s something wrong with them. Let’s begin with the top left. 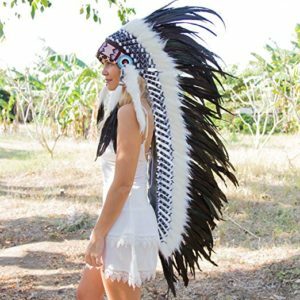 The most glaringly problematic aspect of the photo of the headdress, also for sale, is that the model is a blonde white girl. This is a good way of telling whether a product is authentic because Native peoples are fighting so hard for their representation that one would never have a white model sporting a cultural paraphernalia such as a headdress. However, the description for this product does say “Native inspired” which is due to the American Indian Arts and Crafts Act of 1990 which made it illegal to falsely suggest that a non-Native product is Native made. This is an important development in the Natives’ fight for self-representation and autonomy in art because this type of standardized art production not only competes in the market, but also dilutes the rich cultural ties to the art. This particular craft is much more than its visual beauty. Feather headdresses are ceremonial pieces which involve specific prayers and actions that are deeply tied to tribal homelands (Baker 2012). The use of such a piece in the contemporary world once again distorts a real, practiced culture into something for-profit and, in a way, sexualized. The Women’s Regular American Indian Aztec Pattern Printed Capri Leggings show a much more blatant form of appropriation. The title itself suggests that this product is an authentic iteration of the Aztec’s patterns. The big issue here is the use of the name Aztec as a general term that encompasses these Aztec-inspired geometric prints. American Indian is also in the description, but as this product is imported it’s clear that American Indians had no voice or collaboration in the making of these leggings. By using prints, techniques, and above all stereotypes to sell products, sellers are helping to diminish multiple complex cultures into something for people to dress up in. This is described by Pauline Turner Strong as “playing Indian” which is a large part of American culture. Peoples’ need or want to dress up in Native American garb is largely based on the American imaginary in which Native Americans are a thing of the past, rather than communities of people living today. As Native artist Noel Bennetto phrases it, “this implies that it’s free for the taking since they are no longer present, or somewhat fictitious, an icon of the west, not an existing culture” (Bennetto 2016). This fight for ownership of their cultural art and crafts is a continuation of the generations-long struggle of Native Americans to be recognized as autonomous and worthy in a county that has exploited and oppressed their voices and culture. As per usual with my posts, here are some tips for purchasing Native goods from Native artists, supporting their economy. These tips are from Professor Susan Scafidi, author of Who Owns Culture? Appropriation and Authenticity in American Law. First, consider the source of your product. Was it made by an indigenous artist, or is it a knock-off likely manufactured overseas? Next, consider the significance of the product you may purchase; does it have sacred cultural ties or is it an everyday object? If it does , consider a product that is either cross-cultural with less significance to one particular culture, or a less significant item. Lastly, consider how similar the product is to cultural objects. If it’s a straight up knock off, it isn’t a great purchase. A nod to a pattern or color scheme is more acceptable.